The above info came from Joe, and was edited by yours truly (contact me). The image came from Pojo's Dragonball. Oolong first shows up in the original Dragon Ball series when Goku and Bulma find a village that Oolong repeatedly steals young women to marry. It turns out he didn't want any of the women he took, and so they returned home. Oolong joins Goku and Bulma on their trip, and proves to be useful with his special shape-changing ability. Oolong doesn't have a huge part in the Dragon Ball Z series. 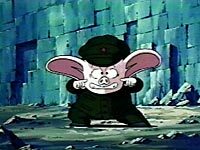 Oolong can only shape-shift for five minutes at a time because he slacked off at and was expelled from the shape-shifting school he and Puar attended. He is seen throughout the Dragon Ball series, and in the beginning of the Dragon Ball Z series, but doesn't shape-shift after Dragon Ball . The above description came from Joe, and was edited by yours truly (contact me).